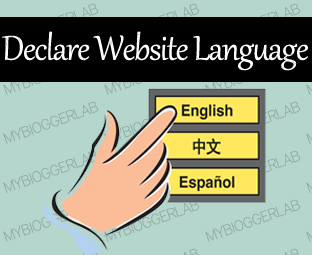 Do you want to declare a Default Language of your website? When a person is creating an international website, then it is significant to describe its language either using HTML or XML Attributions. On the other hand, it also helps in Search Engine Optimization because by declaring a Language, Search engine Algorithms won’t have to spend much time in studying and detecting its language manually. Though most of the popular Blogging platforms have built-in language declaration functionality, but Blogger Platform is not a robust platform. Therefore, we have to manage things manually by adding XML or HTML Language attributions. In this article, we will be learning how a person can declare language of a website with the help of HTML Coding. There are lots of misconceptions in the minds of webmasters that How, when and where should they enter the HTML coding to define their website’s language. Fortunately, W3.ORG has provided detailed information about the whole process. Consider the following tips. Define the lang attribution in each and every page of a website. Specify the Lang code in the URL as well while declaring language. Always utilize lang or xml:lang attribution to define language of a website. Do not add the lang attribution in the between <body></body> tags. How To Declare Language of Website with HTML? The main idea behind declaring language of a website is to provide friendly experience to different browsers and Search engines. If a person is thinking, that after defining Lang attributions his SEO will be improve then he is committing a mistake because it has low Impact on search engine optimization. Furthermore, it will increase the crawling rate because crawlers will be able to fetch your content rather quickly. Follow the instructions mentioned below. According to the prescribed rules by W3C, it’s essential to place the Lang attributions inside the <html> tag. Consider the Following coding. In XML, the coding is bit different but it must be placed inside the <html> Tag. Just like the following example. In Template, search for <html and just next to it paste the following coding. After pasting the above coding in the template, it would somewhat look like the following coding. Once done, Save the template by pressing Save template button. ISO 639-1 is an abbreviation which is used to classify all known languages. Each language has its unique two or three letter. Following is the list of language along with their short codes that can be used as either HTML or XML Lang attributions. Now, just think that by doing a small tweak in our template search engines can easily crawl the website. We have implemented the tutorial on this blog and it is working quite brilliantly. What are your thoughts about this tutorial? Take a lot care of yourself till then, Peace, Blessings and Happy Learning. I know it's not a widget, but you can add this feature in test blog to show how it works, it will help new bloggers what actually it is. Well Dude, its just a simple LANG HTML Tip. It can't be shown in a whole new demo. Hope that answers your question. please tell how to label images with My Blogger Lab tag! Yay..!! Thank you for this code and tutorials. I already implemented this on my Blog. How is it differ from this code "<meta content='english' name='language'/>"? Thank you Syed for the tips.. I think WAJAHAT AHMED is being funny ! DO Both , the meta Attribute and this , in the tutorial . Do both to fully declare the Language !